Background: Bacteremia is associated with periodontal diseases whose extent is related to the severity of inflammation in periodontal tissues. The purpose of this study was to assess and compare the various blood parameters in healthy subjects and severe chronic periodontitis patients. Materials and Methods: 100 patients with severe chronic periodontitis (test group) and 100 periodontally healthy subjects (control group) in the age group 35-60 years participated in the study. Blood parameters were recorded with blood samples drawn from the antecubital fossa by venous puncture. Results: Periodontitis group showed lower erythrocyte count and mean corpuscular hemoglobin concentration (MCHC), and increased total leukocyte count (TLC) and neutrophil, lymphocyte, and eosinophil count, compared to the healthy control group. Conclusions: To conclude, periodontitis may tend toward anemia and there is marked leukocytosis due to increased number of circulating neutrophils and lymphocytes. Anemia of chronic disease (ACD) is defined as the anemia occurring in chronic inflammatory conditions, infections, or neoplastic disorders that are not due to marrow deficiencies or other diseases, and occurring despite the presence of adequate iron stores and vitamins. It is currently thought that proinflammatory cytokines from a given chronic disease process may downregulate erythropoiesis. For thousands of years, blood has been regarded as the ultimate body fluid that could indicate disease process. In the past decade, there has been a renewed interest to study the association of periodontitis and changes in the cellular and molecular components of the peripheral blood. The aim of this study was to assess and compare the various blood parameters including the hemoglobin (Hb), total erythrocyte count, total leukocyte count (TLC), bleeding time, and clotting time in healthy subjects and chronic periodontitis patients. A total of 200 subjects from the out-patient VSPM dental college and research center participated in the study. The study population included 100 consecutive patients who were referred to the Department of Periodontology for diagnosis and treatment of periodontitis. One hundred control subjects (periodontally healthy) volunteered and were selected amongst the subjects who visited for regular dental checkups. It was a cross-sectional study. Prior to the study, the design and purpose of the study was explained to the patients, a detailed proforma was prepared, and informed consent was obtained from all subjects. The study included both males and females in the age group of 35-60 years. The study was approved by the Institutional Ethics Committee and was conducted in accordance with the Helsinky's Declaration. The study included subjects diagnosed with severe chronic periodontitis, as manifested by generalized probing pocket depth (PPD) ≥5 mm (test group) and periodontally healthy subjects with PPD ≤3 mm (control group). Subjects were included in the control group only if they were not having more than one tooth missing per quadrant (excluding the third molars). Those with acute or chronic medical conditions like diabetes, viral, fungal, bacterial infections, etc., smokers, those who experienced recent trauma or tooth extraction, and pregnant women were excluded from this hematological trial. For all 200 subjects, the clinical parameters measured were gingival index (Sillness and Loe), modified plaque index (Turesky Gilmore modification of Quigley Hein Plaque Index), bleeding on probing, PPD, and level of clinical attachment. PPD and loss of clinical attachment were assessed using a William's graduated probe to the nearest 1 mm marking. Under aseptic conditions, venous blood samples were drawn from the antecubital fossa by venous puncture [Figure 1]. The blood was taken in vacuum tubes containing ethylenediaminetetraacetic acid (EDTA) and transported to clinical pathology laboratory within 4 h of venepuncture and blood centrifugation was done [Figure 2]. Measurements of the blood cell parameters were recorded in the clinical laboratory of Department of General Pathology of our institute. 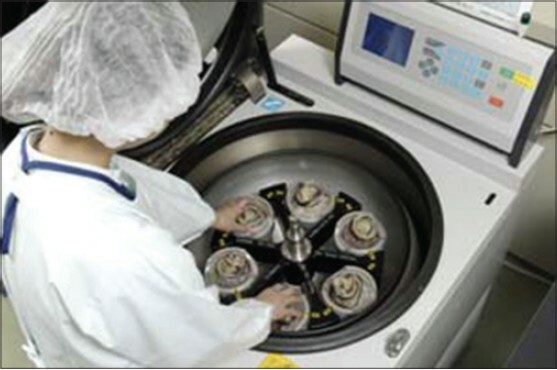 In standardized and automated procedures, the number of erythrocytes, mean corpuscular volume (MCV) of the erythrocytes, and the Hb concentration were measured on Cellydyn 3500. Further, the mean corpuscular hemoglobin (MCH) and mean corpuscular hemoglobin concentration (MCHC), TLC, differential leukocyte count, bleeding time, and clotting time were calculated. Statistical analysis of the data was done using the NCSS software. To determine the difference between two groups, Z-test was applied for all the parameters. The mean age of the subjects in the test group was 43.6 years and in the control group was 41.4 years [Table 1]. There were more females in both the groups. The mean gingival index and mean plaque index were significantly higher in periodontitis patients than in the healthy group, which is as per the inclusion criteria of the test group and also demonstrates proper patient selection for the trial [Table 2]. The mean erythrocyte count for the control group was 4.32 ± 0.61 million/mm 3 , whereas the value for the test group was 4.09 ± 0.56 million/mm 3 (P value 0.04). This decrease in the mean erythrocyte count was found to be statistically significant. Similarly, the MCHC percentage was found to be 31.64 ± 1.16 in the control group and 31.12 ± 1.35 in the test group. This decrease in the MCHC percentage was also found to be statistically significant (P value 0.03). TLC was increased significantly in the periodontitis group, which was statistically significant. The neutrophil, lymphocyte, and eosinophil counts were also increased in the periodontitis patients, but not significantly. The MCV, MCH, and monocytes were also lower in the periodontitis group, but they did not reach statistical significance. Hence, apart from RBC count, MCHC, and TLC, no significant difference was found in any parameter between the two groups [Table 3]. The present study provides further evidence that periodontitis has measurable systemic consequences. Overall data analysis showed that periodontitis patients have a lower RBC count and MCHC and increased TLC and neutrophils, eosoniphils, and lymphocytes. The lower number of erythrocytes and MCHC is not due to iron or vitamin deficiency as the MCV levels are not different between periodontitis patients and healthy subjects; depressed (microcytosis) or elevated (macrocytosis) levels of MCV are related to anemia to iron or vitamin deficiencies. , Yamamoto et al. also showed a positive relation between decrease of erythrocyte count and progression of periodontal disease. These results substantiate the findings put forth by Hutter et al. and Siegel, who also reported decrease in the number of erythrocytes, which was likely to be secondary to the presence of periodontal disease, since the arrest or cure of these periodontal conditions resulted in elevation of erythrocyte count to normal. , Since in our study we did not intervene any of the periodontal conditions by way of treatment and measurements later on, it was not possible to comment whether anemia was a factor that caused periodontitis or a consequence. Our findings do confirm the relationship between ACD and periodontitis. Agrawal studied the effect periodontal therapy on Hb and erythrocyte count in chronic periodontitis patients for a period of 1 year and found a mean increase of 0.22 million/mm 3 in erythrocyte count on resolution of periodontal inflammation. Hb level also increased from 14.5 to 15 mg/dl. These findings are similar to those reported in the literature. However, contradictory results were given by Aljohani, who found no association between Hb levels and periodontal status. Similar results were obtained in this study also for Hb levels. Further longitudinal studies are needed to investigate the association of Hb with periodontitis. There have been conflicting findings as far as the Hb levels are concerned in periodontitis patients. In our study, there was no significant difference between the Hb values for the control and test groups. These findings are in accordance with those reported by Wakai et al. and Havemose Poulsen et al., Hutter et al. and Thomas et al. have shown lower levels of Hb in periodontitis patients. , Agnihotram studied various blood markers in chronic periodontitis patients and found lower number of erythrocytes and increased WBC and neutrophil count, as compared to healthy subjects. These findings are similar to those observed by us in the present study. The positive side of our study was the much larger sample size of 100 subjects in both the control and test groups, whereas the sample sizes were far less in all the previous studies reported in the literature. It is justified by the fact that in early stages of periodontitis, the rate of blood flow is increased due to vasodilation. But subsequently, there is a slowing and stasis of blood stream. With stasis, changes in normal axial flow of the blood in the microcirculation take place. The normal axial flow consists of central stream of cells comprising leukocytes and RBC, and peripheral cell-free layer of plasma close to the vessel wall. Due to stasis, the central stream of cells widens and the peripheral zone becomes narrower because of plasma loss by exudation. After this margination, the neutrophils of central column come close to the vessel wall as a result of redistribution. All consequences finally cause increase in neutrophils and leukocytes. Similar results were found by Nibali et al. The findings of the present clinical and hematological trial confirm the understanding that chronic infections such as periodontitis have systemic effects in terms of blood parameters, indicating anemia. However, the following limitations need further clarification by way of additional research. A comparison of post-therapeutic blood parameters in patients suffering from chronic periodontitis would add to our understanding with regard to the changes in blood parameters in chronic periodontitis. It is concluded from the present study that periodontitis, like other chronic conditions, may tend toward anemia as the number of erythrocytes is lower in affected patients. The low-grade inflammatory state in periodontitis patients is defined by marked leukocytosis due to increased number of circulating neutrophils and lymphocytes. However, it would be prudent to suggest that longitudinal studies, greater sample size, and determining the effect of periodontal interventional therapeutics on the hematological parameters will be desired to arrive at a definitive conclusion. Though the hematological parameters may provide a limited indicator in the periodontal as well as general health status of an individual, they can be utilized as predictors or risk markers of life-threatening systemic diseases and may give an early option for timely intervention. 1. Lee GR. The anemia of chronic disease. Semin Haematol 1983;20:61-80. 2. Scannapieco FA. Position paper of The American Academy of Periodontology: Periodontal disease as a potential risk factor for systemic diseases position paper. J Periodontol 1998;69:841-50. 3. Ward PC. Investigation of macrocytic anemia. Postgrad Med 1979;65:203-7. 4. Samson D. The anemia of chronic disorders. Postgrad Med J 1983;59:543-50. 5. Yamamoto T, Tsuneishi M, Furuta M, Ekuni D, Morita M, Hirata Y. Relationship between decrease of erythrocyte count and progression of periodontal disease in a rural Japanese population. J Periodontol 2011;82:106-13. 6. Hutter JW, Van der Velden U, Varoufaki A, Huffels RA, Hoek FJ, Loos BG. Lower numbers of erythrocytes and lower levels of Haemoglobin in periodontitis patients compared to control subjects. J Clin Periodontol 2001;28:930-6. 7. Siegel EH. Total erythrocyte, leukocyte and differential white cell counts of blood in chronic periodontal disease. J Dent Res 1945;24:270. 8. Agarwal N, Kumar VS, Gujjari SA. Effect of periodontal therapy on haemoglobin and erythrocyte levels in chronic generalized periodontitis patients: An interventional study. J Indian Soc Periodontal 2009;13:6-11. 9. Aljohani HA. Association between haemoglobin level and severity of chronic periodontits. JKAU Med Sci 2010;17:53-60. 10. Wakai K, Kawamura T, Umemura O, Hara Y, Machida J, Anno T, et al. Associations of medical status and physical fitness with periodontal diseases. J Clin Periodontol 1999;26:664-72. 11. Havemose-Poulsen A, Westergaard J, Stoltze K, Skjødt H, Danneskiold-Samsøe B, Locht H, et al. Periodontal and haematological characteristics associated with aggressive periodontitis, juvenile idiopathic arthritis and rheumatoid arthritis. J Periodontol 2006;77:280-8. 12. Thomas B, Ramesh A, Ritesh K. Relationship between periodontitis and erythrocyte count. J Indian Soc Periodontol 2006;10:288-91. 13. Agnihotram G, Mahesh Singh TR, et al. Study of clinical parameters in chronic periodontitis. Int J Appl Biol Pharm Technol 2010;1:1202-7. 14. Noack B, Genco RJ, Trevisan M, Grossi S, Zambon JJ, De Nardin E. Periodontal infections contribute to elevated systemic C-eactive protein level. J Periodontol 2001;72:1221-7. 15. Nibali L, D'Aiuto F, Griffiths G, Patel K, Suvan J, Tonetti MS. Severe periodontitis is associated with systemic inflammation and a dysmetabolic status: A case control study. J Clin Periodontol 2007;34:931-7.